Sheriff says Spring Valley cop Ben Fields is dating a black woman, not racist. A still from one of the videos of the incident at Spring Valley HS. 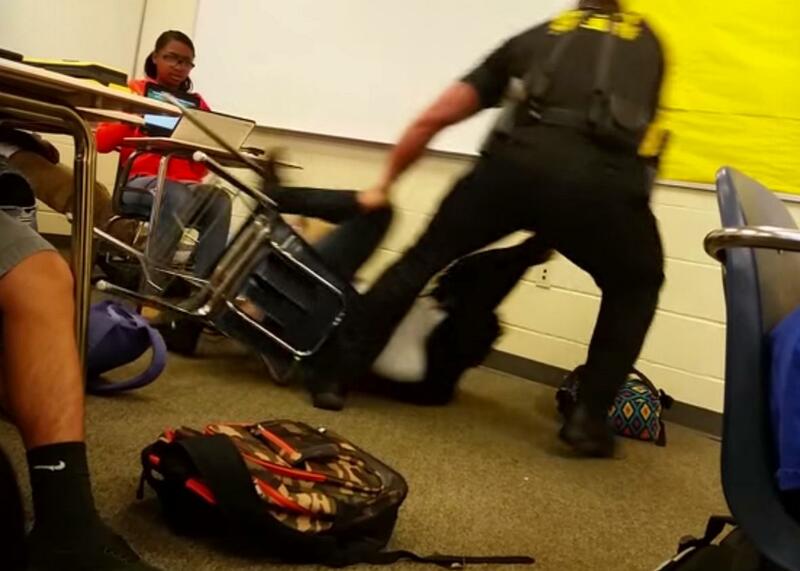 At a press conference this afternoon, Richland County sheriff Leon Lott told reporters that his office is conducting a speedy internal investigation to determine whether the officer caught on video violently arresting a high school girl in Spring Valley, South Carolina this week deserves to be fired. Lott said investigators are looking at three separate videos of the incident, one of which he said shows the girl hitting Sheriff’s Deputy Ben Fields with her fist, and will make a decision about whether he will remain employed within 24 hours. Lott called the video “disturbing” several times during the press conference, and emphasized that the student’s behavior in the situation will be “irrelevant” in evaluating whether Fields violated proper procedure. “What’s relevant,” Lott said, “is his actions.” He added that Fields has been suspended without pay. Phew! Glad we can stop talking about the racial angle of this terrible incident, then.